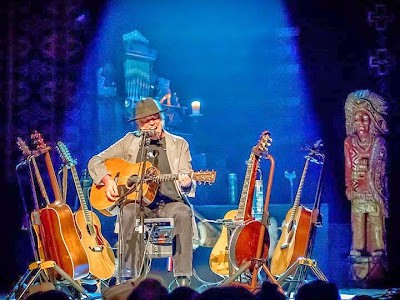 Congratulations to Neil Young on his 50th Billboard charting album. -- Neil Young, "A Letter Home" - No. 13 - The rock veteran's 50th chart entry starts at No. 13 with 15,000 sold. His first charting album was "Everybody Knows This Is Nowhere" (with Crazy Horse), which made its chart debut 45 years ago this month (June 21, 1969-dated chart). OK, so who else has 50 Billboard charting albums in their catalog? More Neil Young news tonight, Saturday, June 7 at 9:00 PM EST, the Thrasher's Wheat Radio Hour from WBKM.org will be streaming. Tonight's edition will feature some highlights from Europe 2013 tour, the latest Neil Young music and news. "Frank Sinatra had 40 Top 10 albums. Perhaps he also had 50 Top 200 like Neil. Maybe Bing Crosby and Elvis come close. But most of their charting albums were compilations like Crosby's several Christmas albums. Good Chance Neil really holds the records for original albums." Richard said: "McCartney has had 48 albums in the top 10 (including Beatles/Wings/solo), and several more that charted below that." Thanks Ralf & Richard ! Looks like Neil's in good company! I recall a quote (which I'll screw up here, but the gist was) Neil saying that any intersection between what sells and what he's doing is mere coincindence. So Happy 50 chart anyhow. Good thing he never aimed for it, he might've missed it.